This dissertation investigates what basic linguistic units children work with during language segmentation and language processing, and whether this differs for pre-literate and literate children and for children speaking different languages. 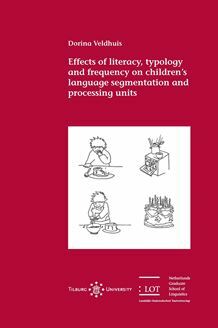 The theoretical framework combines the domains of Cognitive Linguistics, which claims that multiword units such as “bake a cake” have unit status, and of the impact of literacy on the development of metalinguistic awareness, a field that is interested in how children develop awareness of individual words. How children segment and process language was investigated by means of a number of experimental tasks, argued to vary in the degree to which they have a more offline or online nature. The more online a task is, the less linguistic awareness it induces in participants. This has resulted in a proposal for a methodological continuum between offline and online. The tasks were carried out by monolingual Dutch, monolingual Turkish, and bilingual Turkish-Dutch children, aged between three and ten. Results show that becoming literate affects the units children distinguish during overt language segmentation as well as during unconscious linguistic processing to a high degree. The effects of the typological background of the children and of the frequency of occurrence of multiword units were not so salient. Dorina Veldhuis studied Japanese, English and Linguistics at Leiden University. Since 2014, she has been working as a researcher and teacher trainer at the teacher training college for primary education iPabo in Amsterdam. Her current research focuses on how children’s language acquisition can be stimulated through play.